I've had enough out of you 2009. When is your smarter, taller, better looking sibling 2010 getting here? Well the new year is here at last. This had better be good! By the way, yes, I'm now "tweeting" semi-regularly. Super inane updates can be found at @jasonhohoho. PROFILE: An adventurer, inventor, and aristocrat, PRINCE LAZEROS is something of a hybrid between a Renaissance man and swashbuckler. He puts forth a devil-may-care attitude, though in reality he is a deeply motivated individual. Using his family fortune, Lazeros has developed an array of high-tech weaponry and armor. His battle harness (powered by synthetic green Korodite) mimics the principles of He-Man's own battle harness, providing a personal protection field, and enhanced physical strength; his bionic arm-brace allows him full use of his crippled arm; and his energy sword is a formidable weapon, capable of cutting through metal and stone. In He-Man's absence, Lazeros has become a friend and colleague to Man-At-Arms (the two have a friendly rivalry with respect to inventing), and a trusted ally of Team Grayskull. Lazeros has become somewhat smitten with Teela--this has brought him into occasional conflict with Savage (Team Grayskull's other frequent ally) who is already his polar opposite in so many ways. HISTORY: Once nothing more than a frivolous young aristocrat, Prince Lazeros's life changed when he was caught in a terrorist attack while visiting the Eternian capital. The attack was perpetrated by none other than Skeletor and his henchmen. Inhaling a dangerous dose of nerve gas, Lazeros was lucky to escape with his life, though his right arm was left forever crippled. Had it not been for the intervention of He-Man, Lazeros and many others would have died. Inspired by He-Man's heroism, Lazeros dedicated himself to bettering the world, and was able to use his financial resources to become an inventor and adventurer. 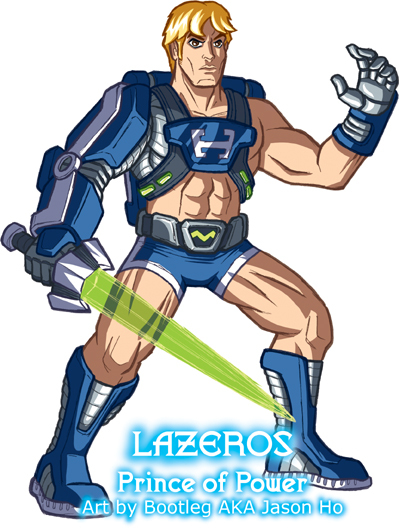 In the years following He-Man's disappearance, Lazeros is one of several young heroes who has stepped forward to fill the void. Dubbed the "Prince of Power" by the Eternian media, his exploits have won him much favor with the public.